The 6.5×55 case has 6 or 7% more capacity than the .260s, even more in practice when both are loaded to standard COALs with heavy bullets, which sees them having to seated very deep in the .260 Rem using up quite a lot of powder capacity. So loaded up for reasonable pressures in modern actions, the 6.5×55 will give a bit more performance. The issue for many is what action length is available or wanted, the 6.5×55 requiring a long action. So sniper rifle / tactical rifle competitors will go for the .260 Rem with the option of the many good short-bolt-throw designs around with detachable box magazines (DBMs). If a bit more performance is needed, the .260 AI (photo right) can yield another 100-150 fps velocity, depending on bullet weight. 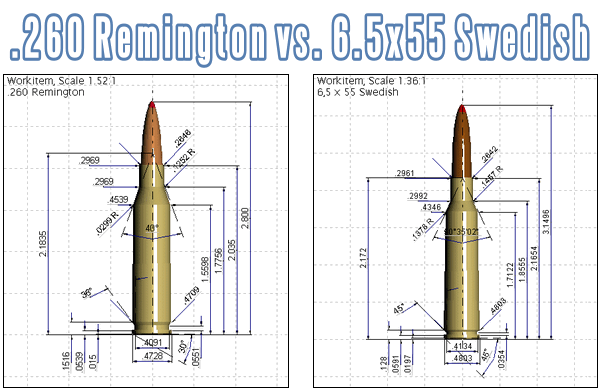 Share the post "Six-Five Smackdown: The .260 Remington vs. 6.5×55 Swedish"